Top: Pictured is Sam Dowd, NIC graduate and recipient of the 2018-2019 Alumni of the Year Award. Pictured above are, from left: NIC President Rick MacLennan, NIC Alumni Association President Pam Claflin, Honorary Aluma Beti Becker, NIC Alumni Association Vice President Jim Lien, and NIC basketball coaches George Swanson and Corey Symons accepting the award on behalf of Sam Dowd. 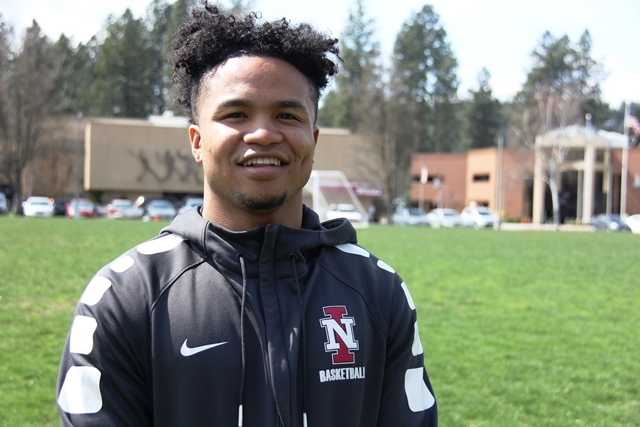 The North Idaho College Alumni Association Board has named basketball standout Sam Dowd NIC Alumni of the Year, and community volunteer Beti Becker Honorary Alumna for 2018. The awards were presented in November at the NIC Foundation Scholarship Celebration at the NIC Edminster Student Union Building. These awards were created in 2001 to recognize outstanding individuals who greatly enhance NIC and the NIC Alumni Association through their commitment and service. Beti Becker is the recipient of the Honorary Alumna of the Year Award. Becker has more than 30 years of human resources experience in the wood products manufacturing industry and recently retired as the vice president of Human Resources of Idaho Forest Group. Recognizing the importance of education, she serves on multiple community organizations promoting employment, education, and safety. Becker serves on the NIC Foundation Board and has been a board member since 2014. She works diligently, partnering with NIC and the NIC Foundation to further develop career and technical education opportunities, expand the educational pipeline for Idaho students, and cultivate the talent pool for the workforce of the future. Becker is deeply committed to connecting education with industry to provide meaningful career pathways. She is also engaged in supporting scholarships for students and securing resources to help NIC students and programs thrive. Sam Dowd is the recipient of the Alumni of the Year Award. Dowd’s courageous story – his journey to achieving academic excellence and athletic success – is inspirational. Dowd played basketball at NIC from 2015 to 2017. He averaged 17 points and seven assists over two seasons, leading the Cardinals to a conference championship. Dowd was an honor roll student and graduated May of 2017 with an associate degree. After graduating from NIC, Dowd transferred to Idaho State University to pursue his bachelor’s degree and play Division 1 basketball. When Dowd was a young boy living in Tacoma, Wash., his parents abandoned him and he was homeless by the age of 13. Dowd said that basketball filled the emptiness of being alone and was the only constant through the uncertainty of his youth. While his classmates wore the latest gear and their parents attended all of their games, Dowd wore hand-me-down shoes and no family cheered for him from the bleachers. His teammates and coaches took the place of the family he never really had. Dowd moved to Spokane with a host family, attended Gonzaga Prep, and continued to play basketball, with their financial support. He was later adopted by another family, Ron and Jill Miller. The Millers attended most every game that Dowd played while he was on the NIC basketball team and were there to cheer him on. In May of 2018, Dowd was awarded the “Most Courageous Award” by the National Basketball Writers Association. Dowd’s story of perseverance and success has been featured in many newscasts and has appeared in national newspapers.